By the turn of the twentieth century, academic nativism had taken root in elite American colleges—specifically, Harvard, Yale, and Princeton. White, Anglo-Saxon, Protestant hegemony was endangered by new kinds of student, many of them Catholic and Jewish immigrants. The newcomers threatened to displace native-born Americans by raising academic standards and winning a disproportionate share of the scholarships. The Half-Opened Door analyzes the role of these institutions, casting light on their place in class structure and values in the United States. 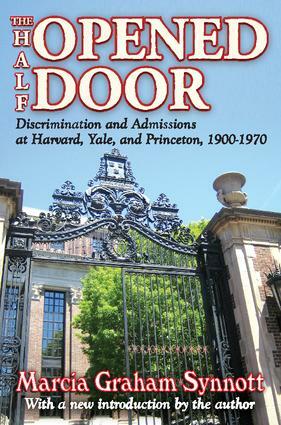 It details the origins, history, and demise of discriminatory admissions processes and depicts how the entrenched position of the upper class was successfully challenged. The educational, and hence economic, mobility of Catholics and Jews has shown other groups—for example, African Americans, Asian Americans, and Spanish-speaking Americans—not only the difficulties that these earlier aspirants had in overcoming class and ethnic barriers, but the fact that it can be done. One of the ironies of the history of higher education in the United States is the use of quotas by admissions committees. Restrictive measures were imposed on Jews because they were so successful, whereas benign quotas are currently used to encourage underrepresented minorities to enter colleges and professional schools. The competing claims of both the older and the newer minorities continue to be the subject of controversy, editorial comments, and court cases—and will be for years to come.